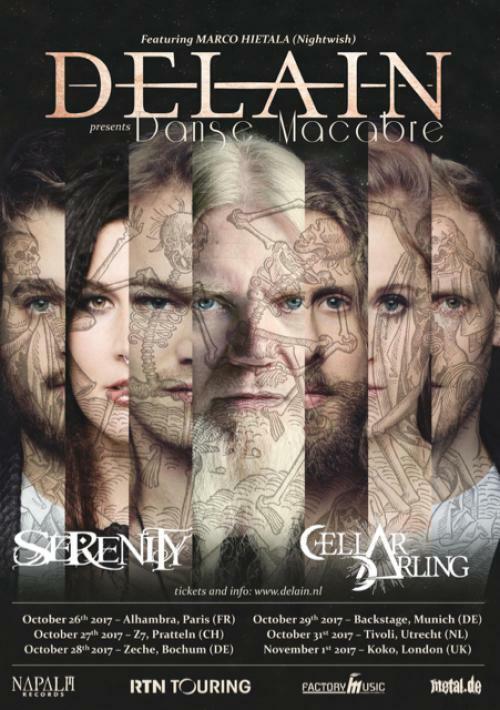 Delain are thrilled to announce their support acts for the upcoming ‘Danse Macabre’ tour. Please join Delain in welcoming Serenity and Cellar Darling to the ‘Danse Macabre’! Serenity will be a well-known name to fans of Delain, their performance at Danse Macabre will be perfectly timed to give fans a taste of their brand new album which is expected to release in August! Cellar Darling might be a new name in the scene but they feature some very familiar faces! Featuring former members of chart-topping folk/metal act Eluveitie; Anna Murphy, Merlin Sutter and Ivo Henzi return to the stage in support of their fantastic debut release. Following the previously announced appearance on all shows of Nightwish lynchpin Marco Hietala, this hand-picked line up will ensure that ‘Danse Macabre’ will be the must-see tour of 2017!